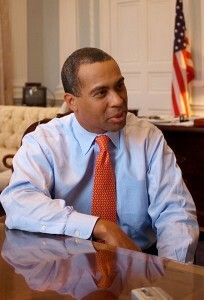 Former Massachusetts Governor Deval Patrick will address Harvard’s graduates this year (photo credit: Scott LaPierre). It’s always a competition to see which colleges will end up with the best commencement speakers each spring. Harvard has shown its hand early this year. Former Massachusetts Governor Deval Patrick will be Harvard’s commencement speaker this spring, it was announced by Harvard. Drew Faust, Harvard’s president, had this to say about the selection of Governor Patrick to headline commencement, as quoted in “The Harvard Gazette”: “Deval Patrick is an extraordinarily distinguished alumnus, a deeply dedicated public servant, and an inspiring embodiment of the American dream. We greatly look forward to welcoming him home to Harvard on Commencement Day.” Governor Patrick is a graduate of both Harvard College and Harvard Law School so it’s indeed a homecoming of sorts. Do you think this is a good get for Harvard? Who do you think would make the best commencement speaker at an Ivy League institution? Do you remember Conan O’Brien’s speech a few years back to members of the graduating class of Dartmouth College? We happen to think that was the best commencement speech ever given. Agree? Disagree? We’re curious to hear from you!